Mold growth is something that can affect any home, and it can quickly become a major concern for the homeowner. 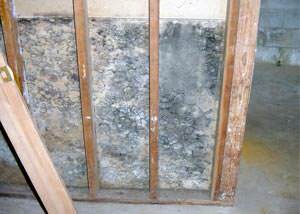 Mold grows quickly in damp, humid areas, and most building materials provide the food source mold needs for growth. If you're having a mold issue in your home, it's important to get professional mold removal services to ensure your home is safe and clean. The experts at Fortress Foundation Solutions have years of experience providing complete mold remediation services that are designed to providing a lasting solution to mold problems. Our fully trained and certified experts know how to identify mold growth and provide mold removal services. Call us today at 1-844-877-3244 or click below to get a free estimate on mold removal for your home in Lynchburg, Roanoke, Charlottesville and the nearby areas! Mold grows quickly: Mold needs only moisture, temperatures above 40°F, and organic material to survive. Moisture is very common in places such as basements and crawl spaces, while the wood and drywall in your home offer plenty of organic material. Mold can grow in 24-48 hours, preferring areas with no sunlight, limited airflow, and little disruption. Cleaning visible mold is not enough: Mold can grow in fiberglass insulation, on top of ceiling tiles, inside ducts, behind drywall panels, in wall cavities, and behind wallpaper. More importantly, the mold you see is likely a sign of a bigger problem you can't see. Mold removal requires professional equipment and training: As, mold removal professionals, we have a variety of state-of-the-art equipment that we use to identify sources of moisture, dry out wall cavities, and safely remove mold that is growing in your home. Samples of mold may be analyzed in a laboratory to identify potentially toxic strains, and special cleaning agents may be used to restore property. Because of the risks involved in spreading mold and the need for special cleaners and equipment, we strongly recommend that you don't try to remove mold yourself using bleach or other household chemicals. Mold impacts property value: Mold issues can dramatically lower the value of your home, and any house with significant mold problems will be difficult to sell. Additionally, mold can lead to serious structural damage to your home, which can be expensive and unsafe. Getting a mold inspection prior to selling your home or purchasing another allows you to be sure that you don't have any serious issues behind the wall and that the house is safe and healthy. Identify extent of damage: As mentioned above, visible mold is usually a sign of a more significant problem. We'll remove drywall and insulation to discover the extent of the damage so that you know how serious an issue your home has. Remove affected materials: Mold can easily spread when disrupted, which is why it's important to have professional mold removal. We quarantine the area and remove carpet, drywall, insulation, and any other materials that have mold growth. This ensures that the mold doesn't spread. Treat the area: Once materials are removed, we treat the entire area with chemicals to kill any remaining mold and prevent regrowth. Depending on the type and severity of the mold, there are different options available. Restore your home: After all mold has been removed and the area is treated, we can return your home to normal. It's important to address any water or humidity issues as part of this process before replacing drywall, insulation, and carpet. If your home currently has mold or is at risk of developing it, the experts at Fortress Foundation Solutions can help make your house dry, clean, and safe. We provide fully trained and certified mold removal professionals operating with the best equipment available, giving you the best solution for your home. If you have issues with mold growth in your home, call us today at 1-844-877-3244 or contact us online to get a free estimate on our complete mold removal and remediation services. We offer all our mold services in Lynchburg, Roanoke, Charlottesville, Blacksburg, Harrisonburg, Danville, Spotsylvania, Winchester, Stafford, Salem and throughout the surrounding areas.